Following the attack on Nouvelle Rouvenor an extreme right-wing government grabbed the power reigns in the Gallente Federation and advocated a harsh response: bombing Caldari Prime and sending in troops to take control of the planet. Those within the Federation believing that peace talks should be initiated instead of an invasion didn’t dare speak up for fear of being branded cowards or, worse, traitors; the Gallente war machine grinded into gear. It soon became obvious that it was a question of when, not if, the Gallenteans would take full control of the planet. The newly formed Caldari government, led by the heads of the Corporations, was far from being in full agreement as to what the correct course of action was. This disagreement, which severely hampered the Caldari State in following a coherent strategy, was only settled after the Morning of Reasoning, when the six most militant Corporations jointly ousted the other CEO’s from power. The Caldari saw that it was impossible to try to fight the much larger Gallente Federation for control of Caldari Prime. Instead, they started devising a plan to evacuate the Caldari population on the planet. For the plan to work an evacuation window of at least one month had to be created by the Caldari Navy; it had to keep the Gallente fleet occupied and away from the planet for this period of time to allow the thousands of civilian and cargo vessels gathered for the evacuation to operate safely. The Caldari high command knew their fleet was heavily outnumbered and outgunned by the Gallente fleet, but they put heir faith in several advantages: first, the surprise factor would help them in the initial stages; secondly, the ferocity of the Caldari personnel, fighting for their home and their families, would carry them through a lot of hardship; and thirdly, the Gallente ships orbiting Caldari Prime were large and cumbersome, little more than shooting platforms ideal for orbital bombardment. The Caldari hoped their small, fast one-man fighters would run circles around the Gallente ships. It is doubtful whether the above-mentioned advantages had sufficed for the Caldari, but they enjoyed one further advantage that they knew nothing about. The extreme right-wing faction that held the reigns of power in the Federation was getting paranoid. They saw conspirators in every corner and started firing prominent figures from the administration and army, replacing them with eager yes-men with little experience and even less initiative. The result was total chaos in the Gallente war-effort. This chaos was not enough to completely halt the military operations on and around Caldari Prime, but it made the Gallente fleet and army ill-prepared for any drastic changes. It was thus with a relative ease that the Caldari fleet managed to take control of the orbital zones of Caldari Prime and drive the Gallente fleet back. Even the most optimistic of the Caldari were taken by surprise and there were even talks that the Caldari fleet should continue to Gallente Prime and repay the Gallenteans by bombing their home planet. But the more level-headed of the Caldari knew that decisively defeating the Gallente home fleet was impossible, indeed it would be hard enough to defend against it once it arrived to reclaim the space around Caldari Prime. So instead, the Caldari high command quickly set into motion their evacuation program and soon millions of Caldari were leaving the planet for their new homes. Two weeks passed. More than half the Caldari population was still on the planet. Both sides employed dozens of scout ships to gauge the strength and intentions of the other. It was becoming obvious to the Caldari that the Gallenteans were preparing a massive assault on Caldari Prime to drive the Caldari out and resume their military conquest of the planet. A new plan was needed. Days passed and desperation began seeping in; the Gallente attack was imminent. Finally, the Caldari admiral Yakiya Tovil-Toba took matters into his own hands. He led the few dozen ships he commanded and jumped to Gallente Prime. Before the stunned Gallenteans could respond he had attacked and destroyed a few stray Gallente ships. But the Gallenteans were quick to recover and before long admiral Tovil-Toba was on the run. But he managed to beat the advancing Gallente ships off and retreat to the moon of Floreau. The Gallenteans stop their pursuit to gather their forces and lick their wounds. The two fleets clashed again the next day and again admiral Tovil-Toba showed his remarkable tactical skills and managed to withdraw relatively unscathed. Tovil-Toba played this game of cat-and-mouse with the Gallenteans for a whole week, except that he was in the role of the mouse. Eventually only one of his ships remained, a badly damaged fighter-carrier. 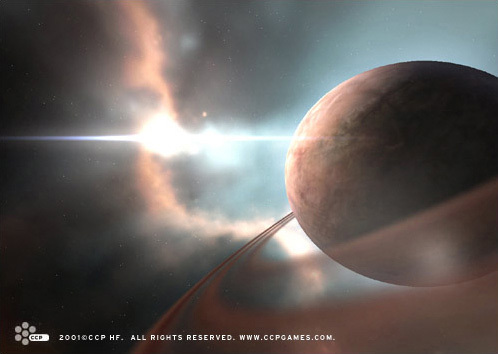 In his dying breaths Tovil-Toba directed the huge vessel down towards Gallente Prime. On entering the atmosphere the ship broke into several burning pieces, killing all aboard. But the largest of these pieces reached the ground and one of them hit the city of Hueromont, killing roughly two million people. Admiral Tovil-Toba and his crew sacrificed themselves in order for millions more Caldari to escape. To this day he is revered as a national hero and his name is one of the first things every Caldari child learns. The turmoil in the Federation created by the Hueromont Incident, as the Gallenteans knew it, toppled the government and a new one took over, this one more willing to listen to those wishing for peace. The week bought by Tovil-Toba and the ensuing confusion following in the wake of the new government gave the Caldari enough time to finish the evacuation of Caldari Prime. Only a small fighting force remained, acting as a guerilla force. One would imagine that peace would now be settled, but it wasn’t to be. A large faction of the Gallente Federation was neither willing to forgive or forget Nouvelle Rouvenor or Hueromont and the Caldari, elated by their success and their belief in superior fighting power with their small one-man fighters, dreamed of returning one day to their home planet. The war was to rage for years yet and some stunning military victories by the Caldari following their Breakout soon led the Gallenteans in a desperate search for an answer against the highly trained one-man fighters that lay at the core of the Caldari victories.